In the work bowl of a food processor add the garlic scapes, pine nuts and Parmesan and process until finely chopped. With the processor running, slowly add the olive oil. Keep adding until the pesto is the desired consistency—I like it to be a fairly thick paste. Add the salt, pepper and lemon juice, process until mixed. Taste and check for seasoning. 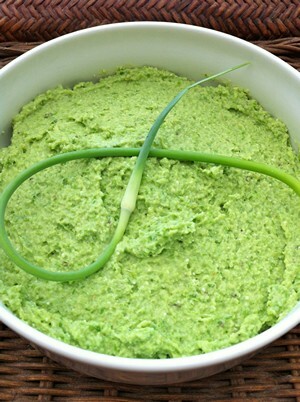 Notes: if the garlic taste is too strong for you, add some coarsely chopped parsley to tone it down. You can also substitute almonds or walnuts for the pine nuts. Toasting the nuts always brings out their flavor. Besides the traditional basil pesto, a mix of arugula and basil with a bit more lemon juice is delicious. I just made a batch of this pesto. It smells heavenly and tastes fantastic! I can’t wait to whip up some pasta to go with it for dinner tonight. Since the Locavore delivered this recipe electronically, does it become “The Great E-scape”? I’ve heard of it, but never experienced it (luckily). Have you? I’ve been using pine nuts from Costco or Trader Joes. I’ll have to check the labels. Hope you buy the more expensive Mediterranean pine nuts, as the cheaper ones (from China) can leave a terrible, metallic taste in one’s mouth for day afterwards. They affect some people much more than others, but that taste is always there to some extent. Have you experienced this? 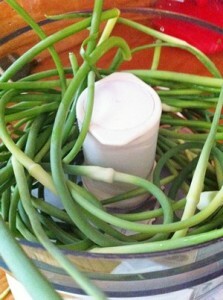 just in time for our garlic scapes…can’t wait to try it! might not be a bad idea for a shcmear (sp?) on a pizza, too…..
Next post: Top Three Food Magazines II: Paper or Electrons?